Frame4J's installation is quite simple. This simple step will get you almost all of the tools and libraries working, also for Eclipse and else if using that augmented JDK. Missing in this minimalistic variant are the javaDoc and the extras for (serial) interfaces, pdf, mail and else. Hint: Nevertheless, we have to note Java 8 deprecating the 20 year old widely used and still propagated deployment via installed extensions. Java 9 dis kill it by 2017, bat wasn't used widely. Since November 2018 we have an adaption to use all Frame4J tools with Java 11 (w/o jigsaw except those requiring proven installed .jars like pfd or RS232/485/usb handling). That's it for Windows — and mostly for Linux also. Since Oracle's sundown Linux will usually have the open JDK and JRE. If, for good reason, you also/only have the Oracle Java, you may have four or more places to handle Java extensions and the like consistently. Tipp: Additionally said link nightmare most often handles javac and java only, forgetting all else JDK tools. You may of course delete ../bib/bsDoesItNative.dll — the replacement being libLinuxSerialParallel.so and javax.comm.properties (from SUN's commAPI or from Frame4J's repository). They go to something like /usr/lib/ respectively /usr/lib/jvm/jdk/jre/lib/. In the meantime RXTX is beyond its premature state and has supporters for Win64 also. Frame4J will move to it. See also Ubuntu in a VirtualBox (German). The first will open a window saying something on Frame4J's version etc. 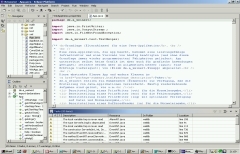 the third will list the computer's (serial and may be parallel) interfaces available for Java. The help texts are available in English or German depending on the system's language or by options -de respectively -en. Have fun. As might have come clear from the above, since 15 years Frame4J and its predecessor will be deployed as installed extensions. Oracle announced to drop installed extensions with Java9. Since Java8_0_40 they're deprecated. As one side effect an automated or manual JDK update deletes installed extensions on the workstation or server. This breaks running applications (when not immediately repaired) and may be considered as a bug. As of August 2015 no real working recipe for migrating from installed extensions to the jigsaw concepts has been presented by Oracle. A migration path must be robust and testable with Java9 (EA). "Make a module and bundle the libraries with the [one] application" is the the only advice found. It won't do. Frame4J is a framework + some 15 applications which are all available as one installation. Those tools are widely used on own and customers servers for automated processes, for example in SVN hooks, since years. Breaking this "Java standard deployment procedure" (since Java1.2, 1998) will hit Frame4J and may hit many others. Let's hope for a viable solution that won't break customer installations and is ready before Java9 or critical Java8 updates that may come.